mono.kultur #13 is dedicated to the mighty GZA, founding member and master wordsmith of the legendary Wu-Tang Clan. Taking the hip-hop scene by storm in the early 90s, the Wu-Tang Clan not only established a new and edgier sound within the American rap world but succeeded in building a hip-hop empire that is to this day unequalled, financially and creatively. Set to coincide with the release of their long-awaited fifth collective album, ‘The 8 Diagrams’, this issue straddles an exceptional career from the beginning to the present. 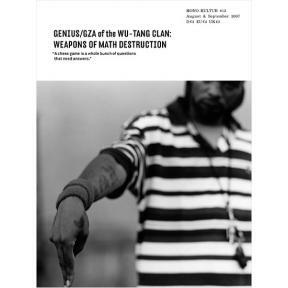 With mono.kultur, GZA talked about the early days of the Clan, the art of chess and the meaning of a pyroclastic flow. This issue has not only a rough core under a glossy armour, it also features some extraordinary reportage photography from the 80s on the emerging hip-hop scene in New York.